Hiring a car is the best way to get out and about, giving you the freedom to explore the island at your leisure, but there are trains across the island and a bus service. 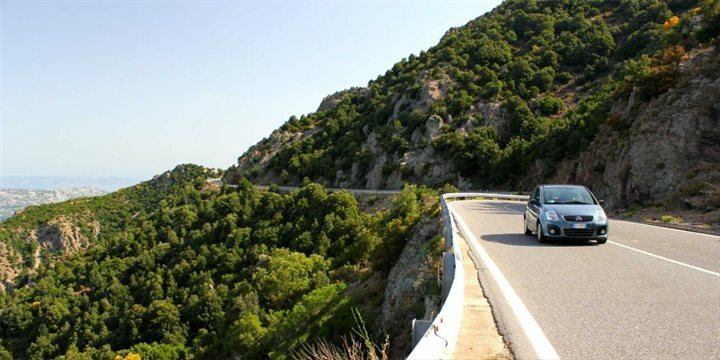 By car, it only takes a few minutes to escape from the tourist routes into the untouched countryside, either along the spectacular coastline or in the mountains. Often you will have the road to yourself, and the island is rich in prehistoric archaeological sites which are well worth a visit. Most of our self-catering properties are located in the countryside, a few kilometres away from beaches and main towns, it is therefore essential to have a car. Car hire is in great demand in July and August and not all car hire grades are available and so it is advisable to pre-book early. Find out more about car hire in Sardinia. As mentioned previously car hire probably affords the most convenient way of travelling around the island. There are no motorways on Sardinia, but on the upside there are no toll roads either. Dual carriageways or superstradas run between most of the main cities, the main roads are generally good, the minor roads tend to be narrow and bendy, but as a consequence offer some spectacular scenery. Please drive very carefully, especially at first, as it may take you some time before you feel comfortable driving in Sardinia. Extra care will need to be taken for guests staying in properties accessed by an unmade road. It is not unknown to encounter cows, pigs or other animals in the middle of the road so stay alert, especially at night when they are not readily visible. Drive well on the right hand side, remembering that minor, narrow roads may be unmarked but are still two-way. Bridges are often single lanes. Remember that when rain occurs after a long dry period, the roads can become extremely slippery so always exercise caution. Unless otherwise indicated, a speed limit of 50km/h applies in built up areas. Outside built up areas and on single carriageway main roads, speed limits are 90km/h (80km/h in wet conditions) and on the few dual carriageways on the island, 110km/h (80km/h in wet conditions). The island's rail network connects into all the major towns on the island, however much of the east and centre of the island is not well served by trains. Alternatively, the "Trenino Verde", an old-fashioned steam train running various routes throughout the island during the summer months, offers a delightful way to discover Sardinia. Tickets can be purchased at stations, through travel agents and online at www.trenitalia.it. Most towns and villages are served by a network of buses, some beaches can also be reached by bus. Timetables however are not always adhered to and service on a Sunday tends to be somewhat restricted. Tickets should usually be purchased before boarding and are sold from ticket offices and local bars, but if that fails you can pay when you board. Buses around cities are an affordable way of sightseeing.